The sun sparkled on the beautiful gold markings and amber shell of “Oceania,” a hawksbill turtle (Eretmochelys imbricata to be exact), as she was gently lowered into the sea from the wooden sailing boat “Buteo” of the Natural Park of Madeira. The previous night had been spent in a tank shared with two conger eels and two grey triggerfish at the Aquarium of the Municipal Museum of Funchal. She arrived in Madeira from Nice, France, aboard a flight of TAP Portuguese Airlines who kindly provided the tickets and allowed her to travel in the passenger compartment. Oceania, a jet set sea turtle, was finally braving the ocean! Like all sea turtle species around the world, the hawksbill, named for its hawk-like head, is on the endangered species list. With an incredibly beautiful amber shell, and a head and flippers of gold with dark brown patches, it is widely considered the most beautiful of the turtle species, and has been intensively hunted to make turtle shell jewelry and artifacts. Its eggs have been harvested in the nesting areas of many countries. Frequenting the tropical waters of coral reefs, and with an appetite for sponges and other denizens of the reefs, the adults can grow to 90 centimeters and reach 60 kilograms. 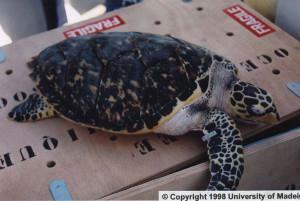 As a 6-centimeter baby, Oceania arrived in Paris in 1993 after being illegally smuggled into France by a traveler returning from some “unknown islands.” She stayed first at the Society for the Protection of Animals on the outskirts of Paris, then on Aug. 24 passed to the Oceanographic Institute of Paris. Oceania remained barely a month before travelling again, this time to the Aquarium of the Oceanographic Museum of Monaco, arriving on Sept. 27. Here under the tender care of Dr. Nadia Ounais and Dr. Pierre Gilles, Oceania proved she was a survivor, thriving and further developing her taste for the high life on a gourmet diet of mussels, shrimp, squid and clams. Five years later, she had blossomed into the full beauty of her species, 38 centimeters long and weighing 6.2 kilograms. Then MEDASSET heard from Dr. Flegra Bentivegna of the Naples Stazione Zoologica “Anton Dohrn” that the Monaco Aquarium, already having one adult hawksbill on exhibit, was trying to find Oceania a new home. MEDASSET, after five months of faxes, emails, telephone calls and planning, and with the kind generosity of TAP Air Portugal – Paris Office, a “hotel” booking for a short stay at the Aquarium of Funchal, Madeira, and a passport provided by the International Convention on Trade in Endangered Species (CITES), arranged for Oceania to once more take to the air. In Funchal she was met by Dr. Thomas Dellinger, co-coordinator of the Section of Marine Biology at the University of Madeira, who together with the Portuguese Society for Herpetology had arranged for her to continue her travels in the warm waters of her species’ natural habitat. Accompanied by Didier Theron from the Monaco Aquarium, she was photographed at Nice Airport, and her story was covered by the Agence Francaise de Presse. Articles and photographs appeared in the French language press around the world, and Canal Satellite/Disney Channel asked for details and photographs. Carefully wrapped in soft towels soaked with seawater and placed in a Styrofoam box inside two wooden crates, she was calm and peaceful during the flight, only showing signs of excitement on landing, rather like human travelers eager to disembark. She held a photo call on the marina dockside. A celebrity to a group of journalists and a television crew, she appeared on the local TV news program “Telejournal,” and the Journal da Madeira published a page-long article. Once aboard the boat, she was tagged and measured for the record. Two or three miles away in Funchal, divers Dr. Thomas Dellinger, Carla Freitas of the Madeira Sea Turtle Project, cameraman Rui Martins of Rumavideo and Didier Theron eagerly awaited her arrival. As soon as she was released and became accustomed to her ocean surroundings, she swam below the surface of the water with regular, calm strokes of her flippers in a straight line towards the northwest. The divers swam with her until they ran out of film, then returned to the boat and made their way home, their lives brightened a little by the turtle’s exotic beauty. In Greek mythology, Oceania was the eldest of the 3,000 daughters of Oceanus and his wife Tethys, nymphs who frequented the seas and shores. She was renowned for her beauty and her compassionate heart. We do not know what adventures await this modern Oceania, but we are certain she will be a fine ambassador of the oceans.